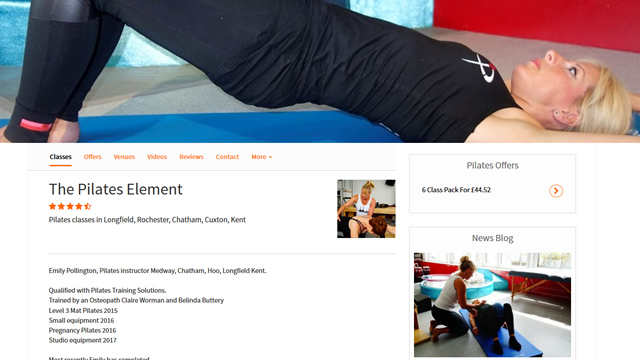 on the UK' s No1 Pilates Class finder and booking platform. Pilates Near You is the best way to market your business and bookings. Save time and money by listing your Pilates classes and reach 145,000 people looking or Pilates classes every month. It's the No1 market plates for Pilates classes Teachers, events and workshops. JOIN today take bookings and payments in advance at no extra cost. Benefit from low card fees easy to use scheduling and booking management system. "I really like Pilates Near You. Really glad I have it for my health practice. The online booking system really works for me. It cuts out a tremendous amount of work dealing with telephone enquiries, texts and emails. It's made my business easier to run. It is simple and straight forward to use and its helping my business grow and expand. The ability to check in people into a class in minutes rather than dealing with cash, cheques and promises makes the process easy. It has saved the practice money because I don't need a receptionist." "It's a really, really good platform. The new profile is amazing. It delivers high quality enquiries - it's a real revenue earner! I have been teaching for 33 years and I can honestly say joining the NearYou platform is the best thing I have done. It’s a strong recommendation." "This is a very convenient website if you are like me and always forget to carry around cash! The multi-class package is perfect if you need an additional incentive to get to class." "Found a fantastic teacher. Really, really pleased. Very easy through the app. Thank you." The unbeatable way to promote your Pilates business online. It's the best way to market your business online and get noticed.